There are many great benefits to using the Excel School Calendar template. This is a great system to get involved with to help keep a teacher on track throughout the entire school year. This calendar is designated in 9-month increments and can be changed to fit in any schedule. This can be a great way to not only keep a personal record, but it is also easy to share this with others. Once you download the template, you will find that this can be easy to print and share with others. 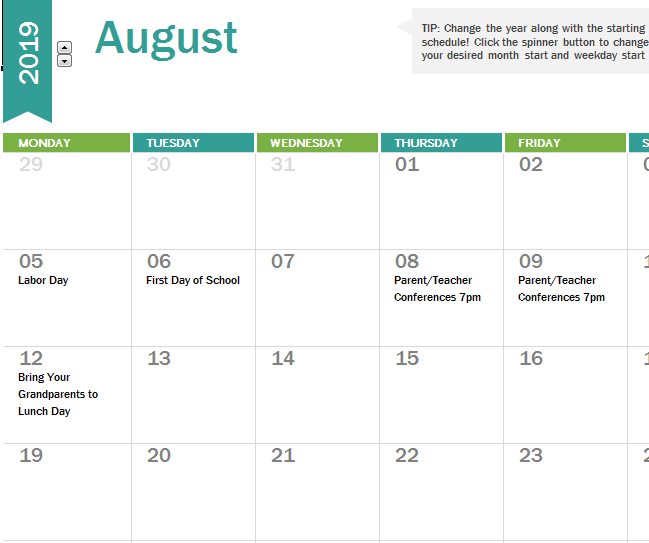 This will allow you to make sure that all people involved in school activities have the same calendar. The template is completely free. You simply download the template, and you are ready to begin using this in any manner you choose. You can print your calendar after a download. This will give you a reference that you can keep with you at all times if you need. This can also be the way that you can share this calendar with others. Adding items to your calendar is simple. You will simply pull your calendar up and add this new information on the given date. It can be helpful to take some time to fill in your calendar when you first download it. This will give you a good start at really using this calendar to the fullest. If you are sharing this calendar with others, you can give them access to this calendar also so changes can be made. This is a calendar that can be used every school year to keep track of all important dates each year. The School Workbook Calendar is the only way that many teachers can remember important dates. This is something that you can easily download and use to make sure that you are staying on top of this coming school year and nothing will be forgotten.